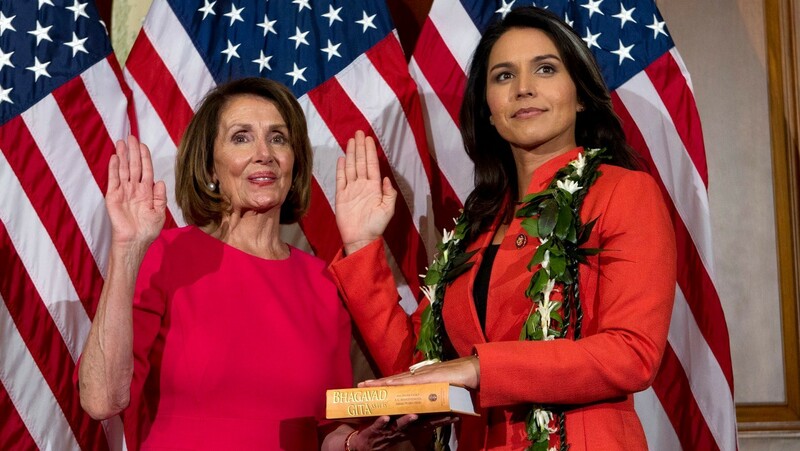 On January 3, 2019, US Representative Tulsi Gabbard is sworn into her fourth term in Congress, taking the oath of office on the Bhagavad Gita. And while some of the headlines covering my announcement could have celebrated this historic first, maybe even informed Americans at large about the world’s third largest religion, they have instead fomented suspicion, fear, and religious bigotry about not only me, but my supporters. That Hindus, alongside countless Christians, Muslims, Jews, Buddhists, agnostics, and atheists, support me should not be newsworthy. But some media outlets have chosen to craft a false narrative of intrigue by profiling and targeting all of my donors who have names of Hindu origin and accusing them of being “Hindu nationalists.” Today it’s the profiling and targeting of Hindu Americans and ascribing to them motives without any basis. Tomorrow will it be Muslim or Jewish Americans? Japanese, Hispanic, or African Americans? I too have been accused of being a “Hindu nationalist.” My meetings with Prime Minister Modi, India’s democratically elected leader, have been highlighted as “proof” of this and portrayed as somehow being out of the ordinary or somehow suspect, even though many of my colleagues, President Obama, Secretary Clinton, and President Trump have met with and worked with him. India is one of America’s closest allies in Asia and is a country of growing importance in a critical region of the world. The strategic partnership between our two countries has been a priority for several decades now. To question my commitment to my country, while not questioning non-Hindu leaders, creates a double-standard that can only be rooted in one thing: religious bigotry. I am Hindu and they are not. When I deployed to Iraq with my fellow soldiers, putting our lives on the line for our country, no one in the media questioned our patriotism because of our religion. No one asked whether or not we could be trusted because we were Jewish, Catholic, Muslim, or atheist. We all took an oath to serve our country and defend the freedoms enshrined in our constitution. My military service has shaped who I am today. While in the Middle East, I saw how quickly religious sectarianism and bigotry can lead to the disintegration of a country — how leaders manipulate people to fear others who are different, who look different, or who have different beliefs. I also experienced how we as people of the world have more in common than we think. Beneath our various beliefs and appearances is our common humanity. This commitment to equality and justice for all are the ideals that our country was founded upon, and what we continue to aspire to as people. We cannot be complacent, and must vigilantly affirm this again and again, as bigotry and hatred have an insidious way of seeping into our society. Religious bigotry and attempts by the media and political opportunists to foment fear of Hindus and others based on their religion persist. During my 2012 and 2014 elections, my Republican opponent stated publicly that a Hindu should not be allowed to serve in the US Congress, and that Hinduism is incompatible with the US Constitution. In the 2016 race for Congress, my Republican opponent said repeatedly that a vote for me was a vote for the devil because of my religion. Republicans like Ben Carson stated in 2016 that a Muslim American would be unqualified to serve as President. Democratic Senators have recently grilled and opposed Republican judicial nominees because of their connection to Catholicism. Not only do these actions and attitudes undermine our US constitution, they incite fear and force people into the shadows because of their religion. Our constitution clearly states that there shall be no religious test for any who seek to serve in public office. After my 2012 election, I made a personal decision to take my congressional oath of office on the supreme yoga/Hindu scripture, the Bhagavad Gita, where Krishna’s teachings have provided wisdom and spiritual solace to me throughout my life, including when I was serving in the Middle East during the Iraq war. After doing so, I was amazed and surprised to hear from thousands of Hindus from across the United States, and even around the world, many conveying how they finally felt free, they felt they no longer had to hide who they are. I will never forget looking into the eyes of a young girl from Texas who shared with me how she’d always been embarrassed to be Hindu — especially among her non-Hindu friends. Like so many other Hindus, Muslims, Buddhists, Sikhs, Jews, Atheists, and “others” — she felt she had to hide or change her religious identification to be accepted in America. “Now,” she said, “I no longer feel that way.” She no longer felt she had to hide her beliefs, faith, or identity, and she could be herself and pursue whatever goals she wants to in life. The heartbreaking atrocity in Pittsburgh last year where 11 people were murdered while worshiping in their synagogue is a reminder of the potential consequences of unchecked prejudice and hatred. The shooting at the Sikh Temple in Oak Creek, Wisconsin and at the mosque in New York, the killing of a young Indian student; the list sadly goes on and on. Enshrined in our Constitution is the separation of state and religion, which means that a person’s religion should play no part in their qualification to serve our country in any capacity. When John F. Kennedy ran for president, his political opponents attacked him for being Catholic, insinuating that he would be loyal to the pope and the Catholic Church rather than to our Constitution. He stated, “For while this year it may be a Catholic against whom the finger of suspicion is pointed, on other years it has been, and may someday be again, a Jew, or a Quaker, or a Unitarian, or a Baptist…Today I may be the victim, but tomorrow it may be you, until the whole fabric of our harmonious society is ripped at a time of great national peril.” He was right. Yet sadly, so many decades later, our country struggles with the same issue — judging people based on their religion, the color of their skin, or where they are from. Our country was established on the basis of freedom of religion, and the Constitution states there would never be any religious test for any public office. It is a freedom enshrined in our Constitution, and that every member of Congress takes an oath to protect — a freedom that many heroes have given their lives to defend. Nothing is more important to our democracy than this freedom. Those who are trying to foment anti-Hindu sentiment expose the dark underbelly of religious bigotry in politics, and must be called out. To advocate voting for or against someone based on their religion, race, or gender is simply un-American. Tulsi Gabbard is a Democrat who was first elected to Congress in 2012 to serve the people of Hawaii’s Second Congressional District. She has served on the Homeland Security and Foreign Affairs Committees in Congress, and is currently a member of the House Armed Services and Financial Services Committees. Tulsi Gabbard has served in the Army National Guard for nearly 15 years, deployed twice to the Middle East, and is one of the first female combat veterans ever elected to Congress. She continues to serve as a Major in the Army National Guard. Tulsi Gabbard was Vice Chair of the Democratic National Committee from 2013 until she resigned in 2016 to endorse Bernie Sanders in his bid for President. Tulsi Gabbard’s campaign is powered completely by people. She does not accept campaign contributions from corporations, lobbyists, or political action committees.